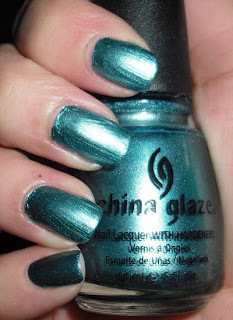 Today maybe a bit of chatty post, but first I wanted to show you China Glaze Adore! Adore is a frosty metallic teal. In many cases I am not fond of frosty colors, but this being a teal and unique color makes it beautiful color in my eyes. This came out in the Spring 09 Romantique Collection. You can still find these shades avaliable for purchase on Head2Toe Beauty. Now on to the chatter! 3 months ago from today I started this blog. I know it's probably silly for me to even mention that, it's only been 3 months! I could of never imagined back then that I would receive all the wonderful comments and great followers I have. I was the type of person who start a journal or a blog when I was younger and make one post and never return to it. This along with many other reasons was why I held off on starting a blog. I have been reading nail blogs since early 2009. I had an interest in blogging, but never thought anyone would read my blog muchless I'd be able to keep up with it. One day 3 months ago I spontaneously woke up and just said I'm going to start my blog today and I've blogged daily since! This blog is very special to me. I named this blog Imperfectly Painted not only because I'm not the best at painting my nails, but as somewhat of indirect reminder to myself that there is nothing wrong with imperfection. I am a perfectionist in real life. I know there is no such thing as "perfect", but sometimes I give myself a hard time or stress myself out trying to achieve perfection. One of the few things I never felt I needed to be perfect about was nail polish, doing my nails, and now writing this blog. Nail polish is relaxing getaway and hobby for me. While writing this blog and sharing a bit of myself and my love for nail polish I've began to embrace imperfection in more areas of my life. Finally the reason I posted "Adore", was because I adore all of you my readers. I know that sounds cheesy and corny, but I do geniunely mean this. I'm no Scrangie or Vampy Varnish, nor will I ever try to be (they are amazing bloggers by the way I just mean I'm not popular :P). I don't have thousands or followers or hundreds of comments, but I don't need to. I am so grateful and appreciative of the people who read this blog and the people who comment on my posts. I am so thankful to have found so many like-minded others out there who share in this fun hobby. I enjoy getting to know all of you and reading your blogs if you have them. Again, I thank you all for sharing in this journey and hobby with me! I felt so gooshy that I found two typos in my comment. Luv Ya! i am so glad i met you ... on twitter! thru MUA and found your blog! i really enjoy it, even though i don't have a chance to comment all the day i read your blog every day. Grats on your 3 months! :) And as *Fleur* said, keep up the good work. I recognize the 1 post never return kinda blogging, and so far I love it as well now. Congrats on 3 months of blogging! You have a wonderful wonderful blog here, so you have a good reason to celebrate! Your blog is wonderful! I enjoy it very, very much. This is a very giving and fun nail/makeup blogging community. It's great! I'm looking forward to meeting up with you some day. This CG is super cute! You are so sweet and I love your blog, because it's Imperfectly Painted and it's you! love Love LOVE! I really like that teal, I am currently loving and lemming all these frosty colours, including that CG! This post is super cute..! I feel like I'm just like you..! I'm kind of a perfection person..
As long as I do my best. Congrats on your 3-month Blogiversary!! :) I'm a new follower, and I'm so happy I found your blog! I'm totally in love with the whole nail polish community, and I'm glad that we can all share our passion for polish together. Here's to many more! You know I am a big fan of your blog. You have a loyal readership because you are an interesting and consistent blogger. You make work hours fun for me! Well done on getting to three months! Ive been going for 5 (but I only have 31 followers) How do you do it? How do you make it popular?